Primatologist Jane Goodall is stepping into an unlikely territory – that of brand endorser. 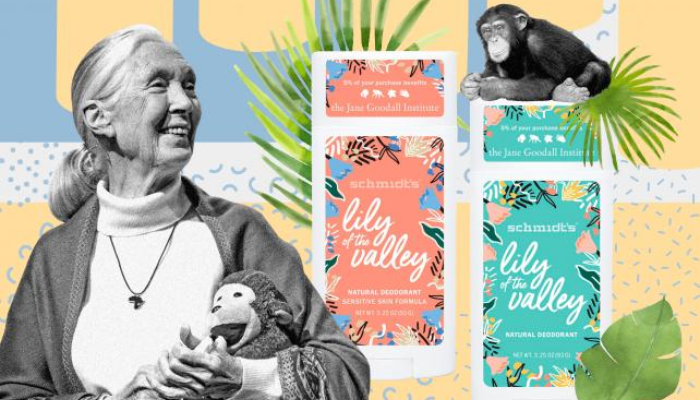 Goodall has aligned with Schmidt’s Lily of the Valley deodorant (a unit of Unilver) and the product will be sold in Amazon’s Whole Foods with in-store promotion aimed at raising awareness and monies for the Jane Goodall Institute. At first glance, this relationship seems odd because Goodall has always been very selective about which companies she partners with as her name is so respected and her brand has so much value. However, it appears that Unilever’s commitment to sustainability helped close the deal. Additionally, Unilever’s global reach (129 countries) was appealing to Goodall because she is passionate about expanding her Roots & Shoots program around the world whose mission is to empower and encourage youth to become leaders to ensure a better future for people, animals, and the environment. The marketplace is seeing more and more celebrity and brand “cause” partnerships because consumers are inclined to purchase products when they know it’s making a social difference and/or it makes them feel good about themselves. Either way, the chimpanzees are the winners in this deal!